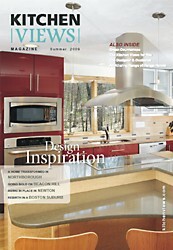 To inspire and inform our customers, Kitchen Views began publishing a design magazine in 2008 to rave reviews. The premiere issue of our design magazine was mailed to 80,000 homes in the Metro Boston area. It was also available at our showrooms and through our website. Now, there are 3 issues of the Kitchen Views Magazine, and the Kitchen Views brochure, all available here on the Kitchen Views website. Similar in size to the Kitchen Views Magazine our 8-page brochure that contains more True Stories. 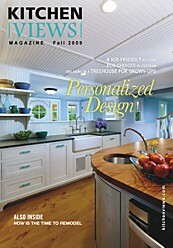 Another exciting feature of the Kitchen Views design magazine is True Stories—a special section devoted to bringing you additional features connected to the magazine articles—including client profiles, image gallery and YouTube videos. Our True Stories series has featured four clients and each of these clients has a first-hand interview featured on YouTube. In our magazines, you'll see a special symbol indicating when additional information is available here on the website. The publication of our third issue, Fall 2009 was distributed inside the 2009 September/ October issue of New England Home magazine. It's available as a PDF file here on our website. This issue includes a fresh selection of interesting articles and lots of examples of Personalized Design through True Stories. Our second edition of the Kitchen Views magazine began the True Stories series. Selected clients graciously opened their homes to be interviewed on video, in addition to having photos taken of their kitchen remodels. You can read the articles in the magazine, and then watch the videos to hear about their personal experiences working with Kitchen Views designers. 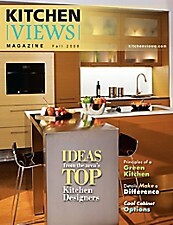 The premiere issue of Kitchen Views Magazine has 16 pages. It introduces you to five of our designers, who shared their views from diverse backgrounds.